The Oldest Armagnac Now Available in the U.S.A.
Dartigalongue, the distillers of this rare cultural artifact, is the oldest Bas Armagnac house operating in the world. They were founded in 1838, in Nogaro, France, the heart of the Bas Armagnac region. This bottle of 1848 vintage Armagnac is part of a very small cache of demi-johns that have been quietly hiding away in the Dartigalongue paradis, and the oldest known certified Armagnac in existence. The grape variety used to make this Armagnac was Folle Blanche and of course this was many years before the devastating phylloxera outbreak. Because of its extreme rarity and age, the producer recently decided to sell no more than 1 or 2 bottles per year in the world. The last ones were sold in Sweden and in France. 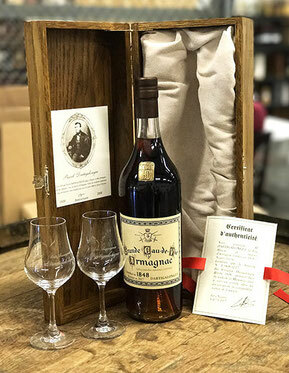 This year, Heavenly Spirits is the only importer so far to have been extended the privilege to purchase this 1848 vintage, and this transaction marks the only bottle ever imported to the U.S.
Other single bottles of Bas Armagnac Dartigalongue, distilled in 1893, 1900, 1918, and two bottles distilled in 1929 accompanied the 1848 vintage in the recent shipment. Each of the rare vintages comes in a specially designed, suede-lined wooden case and includes a certificate of authenticity signed by the Dartigalongue Master Distiller. Another certificate of Authenticity is issued by the BNIA, (Bureau National Interprofessionel de l’Armagnac). This batch of extremely rare Armagnac vintages will be sold in the U.S. mostly through Binny’s Beverage Depot in Chicago, Illinois. Additional rare French spirits imported by Heavenly Spirits will be made available subject to interest and demand.